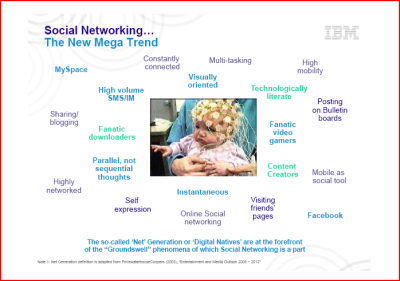 In tandem with the cultural view taken by the Us Now video, I had commented on previously, I came across an IBM presentation through slideshare on the business side of social networks. It was presented at the mobile social networking forum and concentrates on how social networks affect businesses in the media and telecom industries. There are a number of key points to be drawn from the presentation. Social networks while primarily about relationship building are branching out to content distribution and a place for targeted adverts. Brands are creating their own exclusive social networks to build direct dialogue with their customers. The presentation shows four different business models arising depending on the degree of access control and the type of communication. Most of the action is in the shared social space and there is an increasing emphasis on mobile social networking with lots of start-ups all looking to be the next twitter, although for now facebook and MySpace are ahead. For Brands – on the fly dialogue with their customers. Development of context (what is my environment right now) value creation. The $64,000 question (actually a lot lot more) is how to connect to target customers? With the lack of space on most mobile devices, it requires advanced analytics to ensure only relevant information is showing up on the mobile device. Information needs to be very well targeted for any chance of success. There are of course, many other factors to consider including how and where you partner and what mobile platform do you choose. As far as Telcom companies are concerned, they need to broaden the scope of services across the 3 screens (may well become four if netbooks become ubiquitous). This means that services must be similar enough to allow usage across any device yet at the same time take advantage of the inherent technology in the mobile phone, netbook, PC or interactive TV. 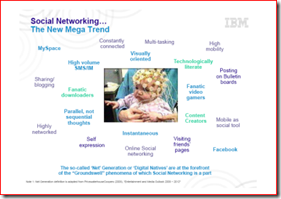 The presentation ends with a reference to a white paper “The changing face of communications” that is well worth a read. This entry was posted in Business Model, mobile phones, social media, Telecom and tagged collaboration, facebook, mobile phones, myspace, social networks, targeting by geoff. Bookmark the permalink.